Decapitation or beheading, is the removal of the head from a living body, inevitably causing death. Beheading typically refers to the act of intentional decapitation, such as a means of murder or execution. It may be accomplished, for example, with an axe, sword, or knife, or by means of a guillotine. 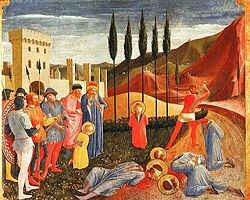 Beheading has been used as the standard method of capital punishment in many cultures around the world throughout history. For some, it was considered the honorable way to die, and reserved for the nobility; for others, the mutilation of the body was considered disrespectful and was used as a most severe punishment. As humankind has progressed, gaining a greater awareness of the value of life and respect for the human rights of all, beheading has become less common—numerous countries have abolished the death penalty while those retaining it seek to impose it by more humane methods, such as hanging, gas chamber, or lethal injection. Ultimately, indeed, intentional beheading has no place in a peaceful, harmonious world. Decapitation (from Latin, caput, capitis, meaning head), or beheading, is the removal of a living organism's head. Beheading typically refers to the act of intentional decapitation, such as a means of murder or execution. It may be accomplished, for example, with an axe, sword, or knife, or by means of a guillotine. Accidental decapitation can be the result of an explosion, automobile or industrial accident, improperly-administered execution by hanging, or other violent injury. Suicide by decapitation is rare, but not unknown. Decapitation is always fatal, as brain death occurs within seconds to minutes without the support of the organism's body. There is no way to provide life support for a severed head with current medical techniques. The word decapitation can also refer, on occasion, to the removal of the head from a body that is already dead. This might be done to take the head as a trophy, for public display, or to make the deceased more difficult to identify. 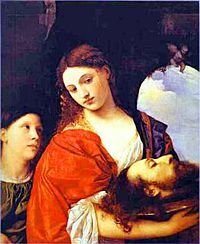 Decapitation has been used as a form of capital punishment for millennia. The terms "capital offense," "capital crime," and "capital punishment" derive from the punishment for serious offenses being the removal of the criminal's head. Execution by beheading with a sword (or axe) was sometimes considered the "honorable" way to die for an aristocrat, who, being warriors, could often expect to die by the sword. The Roman Empire used beheading for its own citizens, while others were crucified. In England it was considered the privilege of noblemen to be beheaded. This was distinguished from a "dishonorable" death by hanging on the gallows or through burning at the stake. 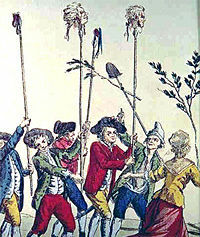 High Treason by nobles was punished by beheading; male commoners, including knights, were hanged, drawn, and quartered; female commoners were burned at the stake. Political prisoners (traitors) and serious criminals often had their heads removed and placed on public display for a period of time. For instance, in medieval England, the heads were placed on spikes along the walls of the Tower of London. Beheading—facsimile of a miniature on wood in the Cosmographie Universelle of Munster: in folio, Basle, 1552. If the headsman's axe or sword was sharp and his aim was true, decapitation was a quick and thought to be a relatively painless form of death. If the instrument was blunt or the executioner clumsy, however, multiple strokes might be required to sever the head. The person to be executed was therefore advised to give a gold coin to the headsman so that he did his job with care. However, Robert Devereux, 2nd Earl of Essex and Mary I of Scotland required three strikes at their respective executions. William the Conqueror was the first to use beheading in Britain, executing Waltheof, Earl of Northumberland in 1076. The punishment was reserved for members of the nobility and royal family who committed such high crimes as treason or murder. Most of the beheadings took place in the Tower of London. It was common that the executioner would raise the severed head, displaying it to the crowd and proclaiming, "Behold the head of a traitor." The last instance of beheading in England took place in 1747 with the execution of Simon Lord Lovatt. In China, decapitation was considered a more severe form of punishment than strangulation, although strangulation caused more-prolonged suffering. Strangulation was preferred because the Chinese believed that their bodies were gifts from their parents, and that it was therefore disrespectful to their ancestors to return their bodies to the grave dismembered. The Chinese had other extremely severe punishments, such as the "lingering death," that involved cutting the body into multiple pieces. When the Communists came to power in the twentieth century, they replaced decapitation with shooting. Decapitation by guillotine was a common, mechanically-assisted form of execution, invented shortly before the French Revolution (although earlier versions such as the Scottish "Maiden" and the English "Halifax Gibbet" were used earlier). The guillotine was designed was to create a painless and quick form of execution that did not require great skill to carry out. 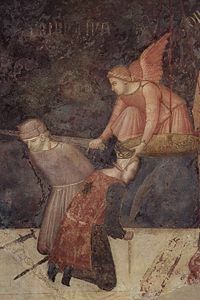 The executioner would hold the severed head up to the crowd. It was believed (with dubious evidence) that the head could still see for around ten seconds. The French had a strict code of etiquette surrounding the executions. A man named Legros, one of the assistants at the execution of Charlotte Corday, was imprisoned and dismissed for slapping the face of the victim after the blade had fallen in order to see whether any flicker of life remained (witnesses say that it flushed as though angry, although with no blood circulation possible, this "evidence" is likely false). While the idea of showing the dying head the reaction of the crowd or their own dead body is perhaps not beyond the cruelty of the revolutionaries, it would certainly go against the "humane" spirit in which the guillotine was introduced and applied. The guillotine was used in France during the French Revolution and remained the normal judicial method in peace time, in use until the abolition of the death penalty in France in 1981. Many German states used a guillotine-like device known as a Fallbeil since the seventeenth and eighteenth centuries. Decapitation by guillotine was the usual means of execution in Germany until it abolished the death penalty in 1949. In Nazi Germany, the guillotine was reserved for criminal convicts. It is estimated that some 40,000 persons were guillotined in Germany and Austria between 1933 and 1945. This number includes resistance fighters both in Nazi Germany itself and in those countries that were occupied by them. As these resistance fighters were not part of any regular army they were considered common criminals and were often taken to Germany where they were decapitated. Decapitation was considered a "dishonorable" death, unlike an "honorable" death, such as execution by firing squad. In Japan, decapitation was a common punishment, sometimes for minor offenses. In addition, decapitation was historically performed as the second step in seppuku (ritual suicide by disembowelment). After the victim had sliced his own abdomen open, another warrior, a selected attendant, (kaishakunin) or second, would strike his head off from behind with a sword to hasten death and to reduce the suffering. The blow was expected to be precise enough to leave intact a small strip of skin at the front of the neck—to spare invited and honored guests the indelicacy of witnessing a decapitated head rolling about, or towards them, whilst spraying blood. Such an event would have been considered inelegant and in bad taste. The sword was expected to be used upon the slightest sign that the practitioner might yield to pain and cry out—avoiding dishonor to him, and to all partaking in the privilege of observing an honorable demise. As skill was involved, only the most trusted warrior was honored enough to take part as the second. The second was usually, but not always, a friend. If a defeated warrior had fought honorably and well, an opponent who wanted to salute his bravery would volunteer to act as his second. Japan continued to use beheading to the end of the nineteenth century, when it was replaced by hanging as the method of execution. In Scandinavia, decapitation was the usual means of carrying out capital punishment. Noblemen were beheaded with a sword, and commoners with an axe. The last executions by decapitation in Finland in 1825 and Norway in 1876 were carried out with axes. The same was the case in Denmark in 1892. The last decapitation in Sweden in 1910 was carried out with a guillotine. Decapitation by sword in modern times has occurred in jurisdictions subject to Islamic Sharia. Saudi Arabia, Yemen, and Qatar all allow decapitation as a form of capital punishment, but only Saudi Arabia practices it: A curved, single-edged sword is used, in public. Saudi Arabian authorities beheaded four men in February 2007—four Sri Lankan workers were convicted in a Saudi Arabian court for an armed robbery committed in October 2004. Their deaths sparked reactions from the international human rights watchdog Amnesty International, which called on the Saudi authorities to abolish the death sentence. Militant Islamic groups have carried out so-called "beheadings" with small knives, some as small as pocket knives. Unusually, these "beheadings" begin with cutting the throat, then slowly hacking away at the spine. Historically, most methods of beheading use a heavy, sharp steel blade, cutting through the neck from behind, which quickly severs the spine, then cuts the blood vessels, trachea, and esophagus: A single stroke usually suffices. The frontal approach more closely resembles Dhabiĥa, a method used to slaughter animals, thereby rendering the meat hallal, in which the goal is to drain all the blood from the animal as quickly as possible. Ritual slaughter of this kind does not require decapitation; only the draining of all the blood. Less orthodox instances of decapitation have also occurred in some areas of Colombia. Marxist FARC guerrilla as well as right-wing paramilitary groups such as the AUC have sometimes used this method to intimidate local populations and political opponents, and it has not been uncommon for criminal gangs of druglords to also make limited use of decapitation on occasion. In 2006, a drug war carried out by Mexico's new president, Felipe Calderón, against druglords and various other criminals caused many beheadings by those druglords in retaliation. The heads were then reportedly tossed into a nightclub and placed in front of various other government buildings accompanied with notes of warning from the druglords. The primary means of decapitation in these cases has been the use of a machete or chainsaw. The militant Islamic separatist group Abu Sayyaf has been known to practice beheading in the southern islands of the Philippines. Beheadings have also reportedly been practiced by the El Salvadoran street gang Mara Salvatrucha, which operates in the United States and Latin America. In Southern Thailand, there were at least 15 cases where Buddhists were beheaded. Thai officials suspected the attackers were Islamist extremists seeking to separate the Muslim-dominated south from the rest of Thailand. ↑ Capital Punishment UK, Beheading. Retrieved May 3, 2007. ↑ BBC, Sri Lankans 'crucified' in Riyadh. Retrieved May 2, 2007. ↑ BBC, Mexico drugs cartels feud erupts. Retrieved May 2, 2007. ↑ Council on Foreign Relations, Abu Sayyaf Group (Philippines, Islamist separatists). Retrieved May 2, 2007. ↑ MS13 News & Analysis, More human heads found in Acapulco. Retrieved May 2, 2007. ↑ Al Jazeera, Thai Buddhist found decapitated. Retrieved May 2, 2007. This page was last modified on 26 May 2016, at 14:56.